Can Captain Marvel beat Superman? Carol Danvers actress Brie Larson believes that she can. Captain Marvel is only a few days away from hitting theaters and Larson is out on the promotional campaign with the rest of her co-stars, who are all doing their best not to trip up and spoil the movie or Avengers: Endgame, which hits theaters at the end of April. So far, everything seems to be going smoothly, but Larson may have just opened a can of worms with her latest reveal. Brie Larson took part in a Google Q&A session where she answered some of the most Googled questions about herself from the search engine. The questions all ranged from a variety of subjects, including asking if she is left-handed. She is right-handed, if you really needed to know, though she learned to fight with both hands for Captain Marvel. When asked if Carol Danvers could beat Superman, Larson didn't even think about the question and simply says, "I can't believe you'd have to Google that, Duh." That is a pretty good question. Marvel Studios boss Kevin Feige has revealed that Carol Danvers is the most powerful character to be introduced in the Marvel Cinematic Universe thus far. This means that Thor and Hulk don't stand a chance against Captain Marvel. Not even Tony Stark and all of his gadgets can take down Danvers. But what about Superman, DC's numero uno? Obviously, this question will be better suited for those who have seen the movie and witnessed the unharnessed power that Carol Danvers possesses. But, there are many who believe that there is no question. DC fans are more than likely going to have to go with Superman. Clark Kent is the man that pretty much started it all and he has a wealth of power and he has fought the Hulk in the past, easily beating him in the comics. But Captain Marvel could easily shut down the Hulk without even breaking a sweat. Superman and Carol Danvers could end up being a draw, or perhaps their powers would destroy the Earth if they ever fought against each other. Again, this will probably have more to do with allegiances than anything else. Regardless of DC vs. Marvel, Captain Marvel hits theaters on March 8th. So far, the movie has been receiving positive early reviews from critics, with some even claiming that it is one of the best MCU movies to date. The fans will be the ones to ultimately make that decision when the movie finally opens. 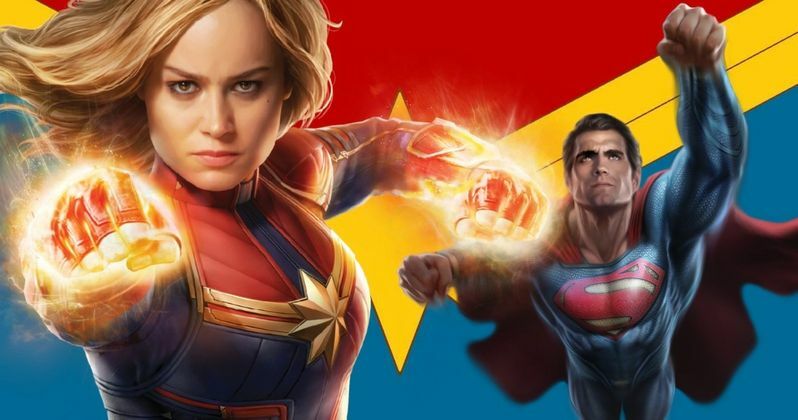 For now, it's safe to assume that Carol Danvers and Superman would have a pretty epic battle, one that could be great enough for Henry Cavill to reprise his role to go against Brie Larson. That will never happen, but it is fun to think about. You can check out the interview with Larson below, thanks to the Wired YouTube channel.